Opt for all-wheel drive, but stick with one of the two lower-end models as the Prestige trim pushes the Q3 into Q5 territory. The Q5 is simply a better buy at those prices. The 2018 Audi Q3 doesn't have time for labels. The small crossover SUV is simultaneously a tall-riding hatchback, the most affordable Audi crossover, a luxury car, and a urban runabout. The Q3 adheres to a simple model strategy, offering one powertrain, front- or all-wheel drive, and three models: Premium, Premium Plus, and Prestige. The Q3 conforms to Audi’s crossover styling cues, but in a smaller package. The look is somewhat stubby, but attractive and it should age well. Inside, it’s not as high-end as other Audis, but the black expanse of the dash is broken up by bits of metal trim and an infotainment screen. That infotainment system isn’t quite as easy to control as other versions of Audi’s MMI, but it still has plenty of functionality, with highlights like Google Earth maps. Interior space is limited. The front seat is the best place to be, though the standard panoramic sunroof robs headroom for taller occupants. The rear seat offers limited headroom and knee room for anyone over 6 feet tall. The cargo area is fairly useful, especially with the rear seats folded down. A 200-horsepower turbo-4 mates to a 6-speed automatic. Acceleration is frisky but not fast. The Q3 has plenty of grip, and good ride quality. Fuel economy is just ordinary at 20 mpg city, 28 highway, 23 combined. On the Q3, Audi fits heated power front seats, satellite radio, and alloy wheels. We recommend the optional sport seats. Also offered are Bose audio, navigation, and 4G LTE data services. Safety is a mixed bag. The Q3 doesn’t offer forward-collision warnings, and it hasn’t been subjected to all current crash tests, but it has performed well in the crash tests it has undergone. The Audi Q3 plays out its familiar crossover shape over a smaller canvas, creating a stubbier, but still attractive look. As a small crossover at the bottom of the lineup, the 2018 Audi Q3 straddles a middle ground between the A3 Sportback (hatchback) and its larger Q5 brother. It doesn’t forge a new path for Audi design: it adopts familiar cues to a smaller canvas. The Q3’s looks almost came predetermined. It had to fit into both the confines of a crossover and an Audi. That meant the roof height, length, and overall shape had to fit into a formula, and so did the grille and other familiar cues. The result is a tidy, though somewhat stubby crossover that should age fairly well. Up front, the Q3’s grille sits low, flanked by narrow headlights that balance out intakes that look fairly large for this vehicle. This year even the base model gets the meaner-looking S line front bumper and door sills. The flanks are sculpted gently, and the glass is slimmer than that of the Q5. The tailgate wraps around the rear end, and the LED taillights provide an attractive rear signature. Inside, the dash is a wide expanse of muted black, with metallic trim and soft-touch surfaces. The ambience isn’t as upscale as other Audis, but it still has a premium look and feel. Unlike some other Audis, the center screen doesn’t stow away, likely due to space constraints, and its controls are moved from the center console to the center stack. The 2018 Q3 is nimble and its powertrain is responsive around town, but it’s not particularly quick. The 2018 Audi Q3 keeps performance simple. Only one engine and transmission are offered, and Audi has just a single suspension setup. The only choice is between front- and all-wheel drive. The suspension features a four-link rear setup with front struts and fairly quick electric-assist power steering. 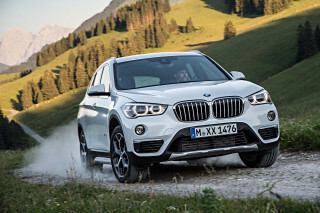 It doesn’t provide a lot of feedback from the road like the BMW X1 does, but the steering is responsive and reasonably quick, the ride is well-damped, and the handling is agile. 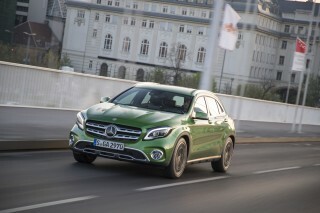 The overall feel is actually sportier than the X1, yet the ride isn’t nearly as harsh as you find in the Mercedes-Benz GLA. It’s a good balance. 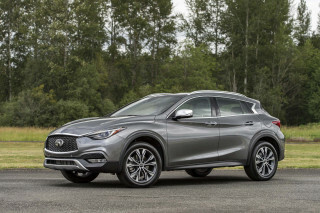 The powertrain consists of a 2.0-liter turbo-4 that puts out 200 horsepower and 207 pound-feet of torque mated to a 6-speed automatic transmission. This engine is exceptionally well-tuned and responsive, and the transmission has well-spaced gears and delivers confident shifts. 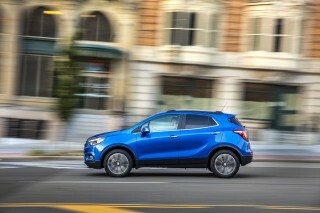 All 207 lb-ft of torque are available by 2,000 rpm, and that helps for getting out ahead of traffic. 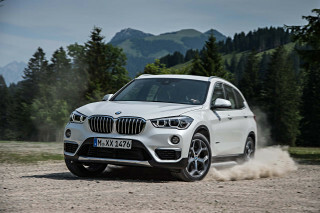 However, at about 3,500 pounds, the Q3 is heavier than it looks and the 0-60 mph run takes a pedestrian 7.8 seconds with front-wheel drive or 8.2 seconds with all-wheel drive. The top speed is 130 mph, but you will likely need patience to get there. If power and performance are the goals, the Mercedes-AMG GLA 45 is the one and only choice in this class. The 2018 Audi Q3 offers supportive optional sport seats and a modicum of interior utility for such a small crossover. At just 172.6 inches, the Audi Q3 is just a foot longer than a Mini Cooper hatchback, giving it a rather small cabin. Still, it has enough space for commuters, couples, or even urban parents with one or two small children. Despite its size, the Q3 has more shoulder room than some rivals, and the center console doesn’t rob too much knee room. Still, the best place to be in the Q3 is the driver’s seat, and, short of that, the front passenger seat. The driving position is natural and the seats are comfortable. The available sport seats are a must-have due to their extra support. Unfortunately, anyone over 6 feet tall will find that the standard panoramic sunroof cuts into head room. The rear seat borders on snug for adult passengers. Here, 6-footers will find their knees up against the front seats and their heads touching the headliner. With the rear seats up, the Q3 has 16.7 cubic feet of cargo space behind in the cargo area. That’s about as much as a sedan’s trunk, but that measurement is taken all the way to the ceiling, so it’s not that roomy. It gets more useful with the rear seats folded down, when it expands to 48.2 cubic feet of space. That’s enough for a couple of roll-aboards and a couple of soft-sided bags or a week’s worth of groceries for the family. In terms of interior quality, the Q3 sits at the bottom of the Audi lineup. That’s not as bad as it sounds, Audi makes great interiors. Still, the look is a bit stark, and the materials are generally good, but not as rich as you get in just about any other model. The Audi Q3 lacks front crash prevention and has been subjected to only limited crash tests. Standard safety equipment includes a rearview camera, the usual roster of airbags, and front and rear parking sensors. Buyers can also get blind-spot monitors, but forward-collision warnings with automatic emergency braking are not available. The Q3 earned top "Good" scores in all crash tests from the IIHS. 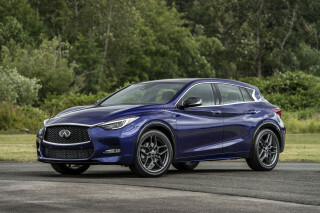 However, it received a “Poor” rating for its headlights and its lack of a forward-collision warning system means it can’t be named a Top Safety Pick or Top Safety Pick+. The NHTSA hasn't yet crash-tested the Q3. Visibility to the rear is somewhat obstructed by thick pillars and small glass area, but otherwise the Q3 is fairly easy to see out of, and the standard rearview camera is appreciated. The Q3’s base equipment is pretty generous, but the higher line models and options take the price into Q5 territory. All models now come standard with the S line exterior trim, which includes different front bumper and door sills, plus S line badging. 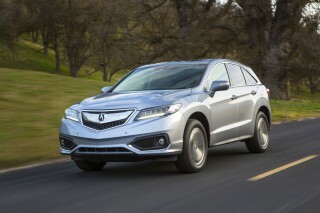 Standard equipment on the Premium model includes 12-way power-adjustable front seats (heated for 2018), keyless ignition, a rearview camera, a 10-speaker AM/FM/CD audio system, satellite radio, a USB port, Bluetooth connectivity, a panoramic sunroof, LED taillights and daytime running lights, and 18-inch alloy wheels. A new Convenience package for the Premium comes with a power liftgate and an auto-dimming rearview mirror with a compass. Premium Plus models add a power liftgate; heated, power-folding side mirrors; full LED headlights; LED taillights; and, new for 2018, blind-spot monitors. The Premium Plus is offered with a Sport plus package that includes a flat-bottom steering wheel with shift paddles, sport seats, Audi’s drive select mode selector, a Black optic exterior kit, black roof rails, and 19-inch, 10-spoke titanium-design wheels with all-season tires. The Prestige trim adds Audi’s Multi-Media Interface (MMI) infotainment system, navigation, a 14-speaker Bose audio system, in-vehicle 4G LTE data services with Audi Connect, and 19-inch wheels. Load it up and the Q3 Prestige tops $40,000, just like its BMW and Mercedes-Benz rivals. The MMI system is run by a knob on the dash rather than a rotary controller on the center console. It’s not as easy to use because the hand can’t rest on the console, but it doesn't dull the Q3's tech sheen. It still offers a high-resolution display with Google Earth maps and plenty of other functionality. 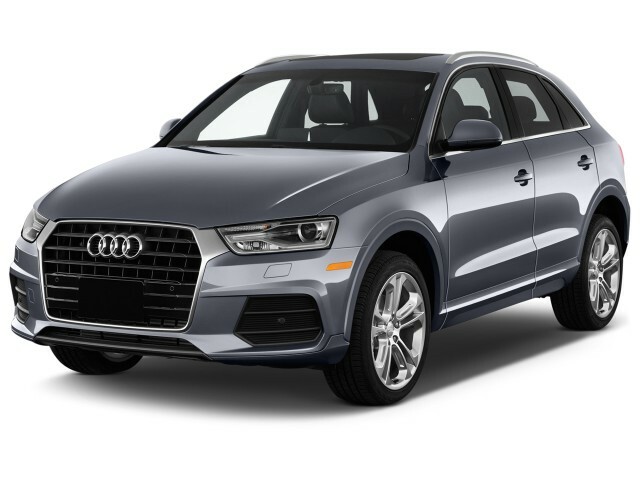 Though small, the 2018 Audi Q3 delivers unremarkable fuel economy that is bested by its rivals and even the larger Audi Q5. The 2018 Audi Q3 is a small crossover, but its fuel economy isn’t as thrifty as its size might indicate. Audi has announced no hybrid plans for the Q3 and any diesel likely has been scuttled by the “Dieselgate” scandal. 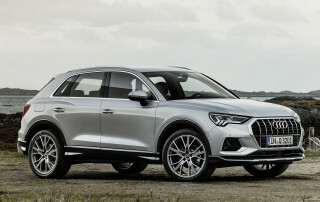 The larger Q5 uses a more powerful powertrain and gets better fuel economy, and competitors from BMW and Mercedes-Benz also beat the Q3 in fuel economy.